Lait de Romalea Bourbon – which means ‘milk of grasshopper’ – joins the distillery’s House of Tamworth experimental series. The range also features Eau de Musc – a whiskey infused with beaver castoreum, a secretion from the castor sacs of the North American beaver and European beaver. It is used by beavers, along with urine, to mark their territory by scent. The romalea exudate from the grasshopper is extracted in a similar fashion to how snakes are “milked” for anti-venom, using “tactile stimulation” of the grasshoppers’ abdomen with the thumb and forefinger to extract the secretion discharge, according to Tamworth Distilling. Post-extraction, the ‘milk’ (or foam) is fermented with black tea leaves. The liquid is then refluxed in acidic ethanol to create the final chemical arrangements, before being dehydrated and infused into the Bourbon. 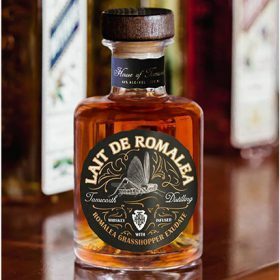 Lait de Romalea is bottled at 45% abv and is said to be a “surprisingly delightful Bourbon”, with a “floral, rosy and fruity” nose that leads to flavours of plum, berry and “subtle” tobacco on the palate. It is available for a limited period through online retailer Warehouse Wines & Spirits for RRP US$75 per bottle. Matt Power, Tamworth Distilling lead distiller and resident chemist, said: “Working at the chemical level, we found that this malodorous [foul-smelling] stuff is composed of a type of molecule that is a precursor to the ones that give roses (and Bourbon) their deep, enriching scent. “To unlock this pleasant quality, the grasshopper foam is first milked, then fermented with wilted tea leaves, whose enzymes prep the smelly substance for an acidic distillation that completes the chemical rearrangement. Tamworth Distilling is not the only producer experimenting with animal bodily fluids. Last month, Ibhu Indlovu – a gin made with botanicals sourced from elephant dung – launched in South Africa.